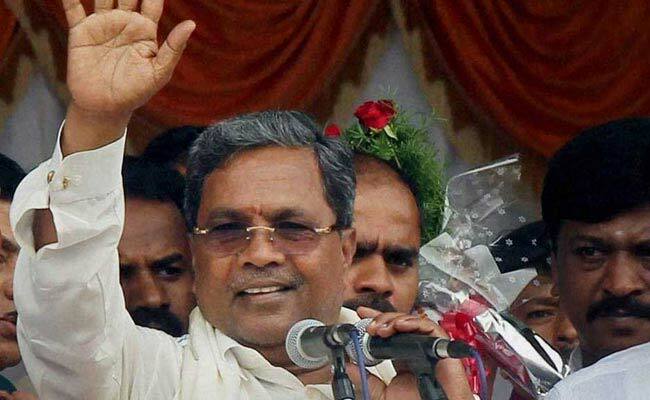 Karnataka Chief Minister Siddaramaiah accused PM Modi of telling a "tissue of lies". Bengaluru: Hitting back at Narendra Modi for his all-out attack on his Congress government, Karnataka Chief Minister Siddaramaiah today accused him of telling a "tissue of lies" and said he was "morally not fit" to be prime minister. "He did not speak as prime minister. He has uttered a tissue of lies and made baseless and irresponsible allegations," Mr Siddaramaiah said in an angry rebuttal to a litany of charges by PM Modi at a BJP rally in Bengaluru yesterday. He said the "countdown has begun for Narendra Modi," citing the results of Rajasthan by-polls in which the ruling BJP faced an embarrassing defeat at the hands of the Congress which won two Lok Sabha seats and one assembly segment. This came as a retort to PM Modi's assertion that the countdown for the exit of the Mr Siddaramaiah government had begun and it was at the exit gate. Sounding the poll bugle for the upcoming Assembly polls in Karnataka, PM Modi had accused the Siddaramaiah government of creating new records in corruption and dubbed it a "10 per cent commission government." "If they have evidence to prove, let them furnish the documents under which project or scheme corruption happened," the chief minister said. Raising the issue of murders of several BJP and Sangh Parivar activists, PM Modi had alleged criminals were ruling the roost and "ease of doing murders" was being discussed in the state while his government talked of ease of doing business. "He (Modi) has accused the government of taking 10 per cent commission in all the schemes and programmes. This is the most baseless and irresponsible allegation," he told reporters. Giving a point-by-point rebuttal, he said "Modi as a prime minster has lied to the people of the state and misled them by giving wrong information. According to me, he has denigrated his position." Asked if he thought PM Modi was fit to continue as prime minister as he had accused him of lying, he said, "according to me, he is morally not (fit) to be prime minister." Attacking PM Modi for the corruption jibe, he said BJP state chief B S Yeddyurappa was seated next to him at the rally and the prime minister should have known about what all happened during his term as chief minister.